Otto Feuer survived three concentration camps in six years. 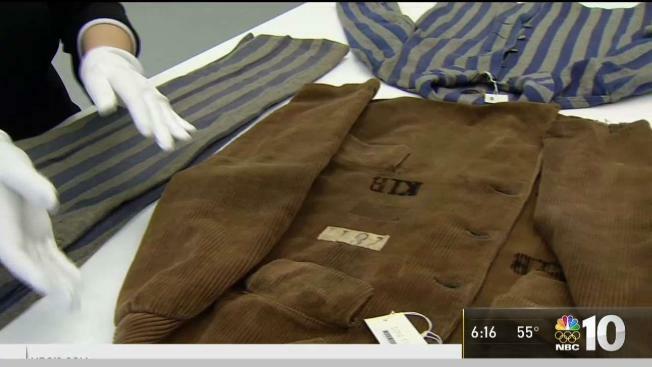 One brown corduroy jacket accompanied a holocaust survivor from Germany to New York City, and now, more than 70 years later, the jacket lives on thanks to that man's son. NBC10's Jim Rosenfield has the story. Holocaust survivor Otto Feuer wore a brown corduroy jacket on the day he thanked U.S. forces for liberating the Buchenwald Concentration Camp in April 1945. He kept that jacket until his death in the 1980s, a reminder of surviving the darkest era in modern history. The jacket traveled with him from Germany to New York City, where he eventually married and raised a family. Now, more than 70 years later, his memento lives on at the U.S. Holocaust Memorial Museum Shapell Center, which preserves artifacts in a secure location in Maryland. His late nephew and adopted son Peter, a Montgomery County, Pennsylvania, resident, donated that jacket and $1 million to the conservation center before he died in the spring. NBC10's Jim Rosenfield visited Michael and the Holocaust conservation center to learn more about Otto’s life and his lasting legacy. In old photos from World War II, Otto can be seen hanging from a post, his arms twisted behind him in a grotesque shape as his body slumps forward and his head hangs down. One other man is pictured next to him in the same position. A third man is on the ground, seemingly dead. But all three survived Buchenwald, which was built in 1937 near Weimar, Germany. That camp housed some 250,000 prisoners, including Jews, communists, gypsies, criminals, Jehovah’s Witnesses and the unemployed. Gay people were the subjects of cruel science experiments meant to “cure” homosexuality. On April 11, 1945, emaciated prisoners, including Otto, stormed the watchtowers and seized control of the camp. Later that afternoon, American forces wrestled control of Buchenwald away from Nazis. In a newsreel recorded two weeks later, 31-year-old Otto can be seen thanking his liberators. He wore the corduroy jacket, which still has his prisoner number sewn into it. Inside a climate-controlled vault, more than 18,000 artifacts are stored alongside Otto’s jacket. They include prison uniforms, Stars of David, artwork and armbands Nazis forced Jewish people to wear. The vault housing Otto’s belongings is one of nine, and officials at the conservation center expect the number of artifacts to double in the next decade. After Otto moved to the U.S., he adopted Peter and Peter's sister, Doris. The two children became Michael’s adopted siblings. Michael stored his father’s jacket in his attic after Otto died. It wasn’t until Peter asked him what became of it that Michael dug the relic out of a garment bag. “I’ve been hoping that there are more people who can benefit from the knowledge of that jacket and the story” behind it, Michael said. Perhaps one of the most intriguing parts of the jacket is Otto’s ability to regard it with a sense of detachment. He joked with family that it survived six years of Hitler only to snag some time later on a park bench in Paris. “He had a rather remarkable ability to remember and describe experiences in … a certain kind of intellectually curious way, not only in a way that is fraught with emotion and pain, but with true fascination,” Michael said. Michael first saw his father’s jacket and prison uniform when he was a teenager. Otto wanted to show him the before-and-after of his life — the juxtaposition of surviving three concentration camps only to raise a family in relative comfort thousands of miles away from where his was once tortured. Otto advised Michael not to “get too emotional” when seeing the artifacts, but instead to treat it as a growing pain. That was Otto’s way. “He always said the fact that he survived was a matter of luck,” Michael said. In 1995, Michael and his immediate family traveled to Buchenwald for the 50th anniversary of the camp’s liberation. They stayed in nearby Weimar, a town about 5 miles away that once birthed one of Germany’s most liberal constitutions. A bus pulled up to transport people to the former concentration camp, the haunting name emblazoned on the shuttle like any other tourist attraction. The normalcy of that sign struck Michael, he said. At the camp, Michael met one of the men pictured laying on the floor next to his father, who was strung up on a post like a piece of meat hung out to dry. His name was Jack Werber. He helped save more than 700 children at Buchenwald in the final months of World War II, according to his New York Times obituary. It was there at Buchenwald that Michael first saw the video of his father after liberation. Otto was wearing the corduroy jacket, but Michael didn’t even notice. He was too stunned at seeing his father young and gleeful after tasting freedom for the first time in years. People crowded around, looking at him and then looking at the man in the video. Several of Otto’s relatives received visas as Adolf Hitler’s forces descended on Jews and others deemed “asocial.” His brothers escaped to New York, but Otto was arrested before receiving his travel papers. Otto’s mother also had a visa yet decided to remain in Germany along with her son. She was later killed in a gas chamber, the family suspects. “She wouldn’t leave so long as one of her boys was in a camp,” he said. Otto reunited with his relatives stateside in 1947. Several settled in Erie, Pennsylvania, and others in New York. Within six months of starting a new life in America, one of his brothers died and left two children behind. Peter was one of those kids. Decades later, Peter dedicated himself to preserving his adopted father’s legacy and, perhaps, honoring the man who took care of him when no one else could. “It’s really a full circle,” Michael said.